Windows 8 runs common maintenance tasks on your tablet automatically at 3 a.m. each morning. At the appointed hour, Windows 8 connects to the Internet to download any waiting software updates, update its virus definitions, check your computer for viruses, and perform other bits of computerized housekeeping. Depending on how you use your tablet and the strength of your Internet connection, however, your tablet might not have a chance to perform some maintenance tasks, and they pile up in the background. Fetch the Charms Bar, tap the Settings icon, and tap Control Panel at the top of the Settings pane. Tap the System and Security icon, tap the Action Center icon, and tap the Maintenance category. 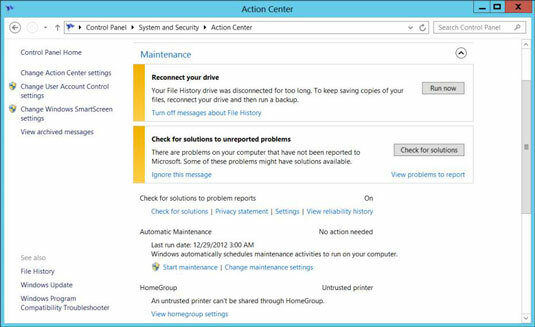 The Action Center window appears, showing the Maintenance section. The window shown, for example, shows two missed maintenance items: Reconnect Your Drive, and Check for Solutions to Unreported problems. Each task offers a button; tap the button to begin running the adjacent task. If your tablet is sleeping at 3 a.m., Windows runs its maintenance tasks the next time you turn on your tablet. But if you prefer a different maintenance time, tap the Change Maintenance Settings link; when the drop-down menu appears, choose a new time instead of the default 3 a.m. time.